The Law Offices of Brandon Sample represents clients facing federal mortgage and bank fraud charges during all aspects of pre-trial, trial, sentencing and appeals. It is important that your bank fraud lawyer be well-versed in all parts of the federal criminal process so that you can anticipate how your defense to mortgage or bank fraud charges will play out throughout the entire case. 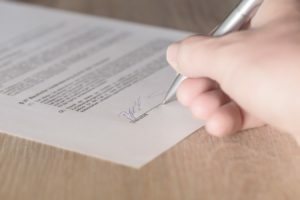 Federal mortgage and bank fraud crimes have many nuances in the way that they are typically prosecuted and the potential defenses that may be available to you, which is why it is in your best interest to work with a mortgage fraud attorney who has in-depth knowledge of working this type of criminal case from investigation to appeal. Federal Mortgage Fraud: What is It? Generally, federal mortgage fraud involves some misrepresentation knowingly made by an individual in the context of mortgage transactions. Typical mortgage fraud schemes involve a home purchaser or a real estate professional knowingly providing false information on a mortgage application, home appraisal or other home sale document. The home purchaser or investor could be attempting to obtain a property under false pretenses or with knowingly false information. A real estate professional could be attempting to make more money off of his role in a real estate transaction using knowingly false information. This could involve inflating property values, hiding known defects in property flipping, submitting untrue information on a loan application so that a buyer obtains a mortgage that he would not rightfully quality for or taking a second mortgage out on a property for a buyer’s down payment without the banks knowing. If any of these apply to your individual circumstances, you need to retain an experienced mortgage fraud attorney as soon as possible. In 2009, Congress passed the Fraud Enforcement and Recovery Act (FERA) to give federal prosecutors additional opportunities to seek out and prosecute mortgage fraud crimes. This means that more mortgage fraud cases have been prosecuted at the federal level than ever before over the past 10 years. An important aspect to keep in mind about a federal investigation involving mortgage fraud is that it will typically lead to additional charges, such as wire fraud or bank fraud. Transactions allegedly involving mortgage fraud are likely to fall within other categories of criminal activity because of the nature of how the crimes are commonly conducted. This means that a federal criminal defendant initially charged with only federal mortgage or bank fraud should anticipate having to contend with additional charges from the federal government. By retaining a mortgage fraud attorney early on in the investigation or criminal process, the lawyer might be able to shield you from additional criminal liability. Federal Bank Fraud: What is It? Federal bank fraud crimes are addressed by 18 U.S. Code § 1344, which states that bank fraud occurs when someone “knowingly executes, or attempts to execute, a scheme or artifice to defraud a financial institution; or to obtain any of the moneys, funds, credits, assets, securities, or other property owned by, or under the custody or control of, a financial institution, by means of false or fraudulent pretenses, representations, or promises.” If you believe that you might have fulfilled any of these elements, you need to speak with an experienced bank fraud lawyer. A bank fraud crime can involve targeting the bank itself or the depositors of funds into the bank. For example, one of the most common forms of bank fraud against the bank is to write a check out to the bank to be cashed when the individual knows that he does not have enough assets in his account to rightfully obtain the money for the cashed check. A common crime against depositors in the bank is when an individual uses personal or financial information obtained from a depositor at the bank without authorization and then uses that information to open an account or borrow money in the depositor’s name. It is also a crime for a person or organization to pretend to be a federally insured financial institution and solicit deposits from other people, investors or companies. A bank must be licensed by the Department of the Treasury as well as a federally insured institution. Pretending to have official licensure to operate as an insured bank without having done so is a form of theft against those uninsured depositors. It is important to note that the right time to speak with a bank fraud lawyer is as soon as possible. If you have willingly or unwillingly engaged in any of these actions, or are under investigation for doing so, a bank fraud lawyer can help to reduce your criminal liability. Even if you have already been charged with a crime, retaining competent counsel is essential to mounting an effective defense. What are the Potential Penalties or Criminal Liability? Being convicted of only one count of federal mortgage or bank fraud can mean serving up to 30 years in federal prison, paying fines up to $1 million and having to make restitution to the victims harmed as a result of the fraud scheme. In addition to the criminal penalties at play in the criminal prosecution of federal mortgage or bank fraud, the defendant may also face civil penalties in a separate lawsuit. This is because mortgage fraud and bank fraud are not victimless crimes. There is a way for those who have been defrauded in the fraudulent transaction to pursue their own recovery by filing a claim against the responsible individuals. The amount that a convicted defendant will have to pay in criminal penalties is not reduced by the amount of a civil judgment that he must also pay. This is why being convicted of mortgage fraud or bank fraud can devastate someone financially. By hiring a mortgage fraud attorney or bank fraud lawyer early on, you can limit both your criminal and civil liability. Call the Law Offices of Brandon Sample at 802-444-HELP (4357) to schedule a consultation with attorney Brandon Sample about your federal mortgage or bank fraud case as soon as you learn that you may be facing criminal charges. Our mortgage fraud attorneys and bank fraud lawyers have experience in defending such cases and are able to mount a competent and informed defense to such charges.